In neighborhoods from New Tampa to Clearwater, homeowners know who to call when they need an air conditioning repair. They turn to Caldeco Air Conditioning & Heating for a prompt response and expert AC repair service by our NATE certified technicians. Since 1989, Caldeco Air Conditioning & Heating has not only provided the best repair and maintenance services, but has been committed to serving the community through participation and memberships in many local charities, service organizations, programs and projects. When the thermostat temperature is rising and you suspect you need an air conditioning repair, you need an AC repair company you can trust that carries quality products covered by a warranty. Carrier Corporation, an air conditioning equipment manufacturer, has been providing air conditioning, refrigeration and heating solutions worldwide for over 100 years and is the recognized leader in the industry, and Caldeco Air Conditioning & Heating is proud to be a Carrier Factory Authorized Dealer. We are honored to have won the Carrier President’s Award in 2007, 2009, 2015 and 2016. Winners of this prestigious award are held to higher standards and chosen for superior leadership, integrity and performance. 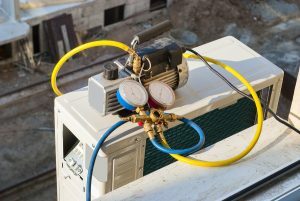 We offer regular routine air conditioning maintenance to help prevent the need for an AC repair and also carry and install new AC systems should the need arise. If you have been noticing potential problems with your AC unit, it is best to have a Caldeco Air Conditioning & Heating technician look at it before you have a total shutdown of your system. Contact us today to schedule air conditioning repair service in Tampa, Wesley Chapel, Brandon, West Chase or any surrounding cities now.